Ring of Fire Glass Dragon Eyes Fantasy Art Dolls Taxidermy Sculptures or Jewelry Making Crafts Matching Set of 2 (40mm) by Megan's Beaded Designs at Designers Artists. MPN: 579588941-40MM. Hurry! Limited time offer. Offer valid only while supplies last. Featuring unique eye designs, that I created digitally, these cabochons are sure to make your creations a hit! Perfect for doll or jewelry making. Add depth and character to your handmade projects with these riveting glass dragon eyes! 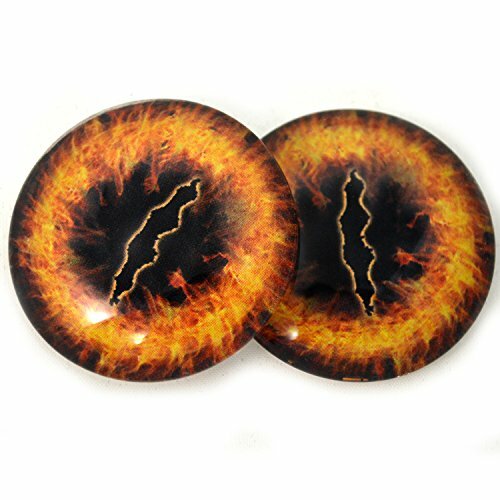 These original, ring of fire dragon glass eyes are mesmerizing and spellbinding.